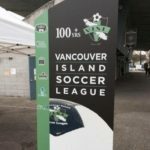 It was an entertaining weekend on the soccer front on Vancouver Island as Division 1 league play had its fair share of drama. Add in the McGavin Cup Final on Monday, and there was no shortage of local soccer. 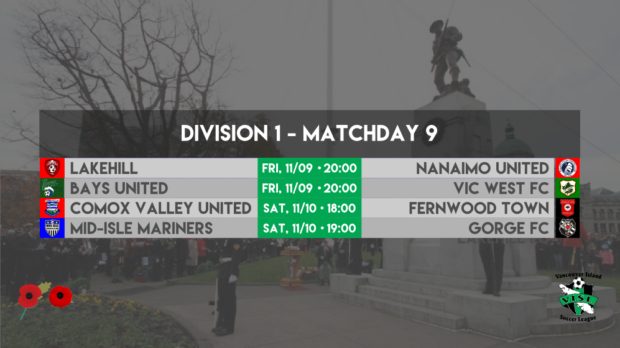 It was a great weekend to remember those that did so much for all of us – so we could live how we do and all VISL games from Friday to Monday took time to reflect, and no doubt we are grateful. Here is what happened in League play over the weekend. At Braefoot on Friday night, Lakehill snapped their losing streak by putting in a good effort to beat second-placed Nanaimo United. Lakehill goals by Keegan Lang, Nicholas Pineda-Graham, and an own goal saw the home side over the line by a narrow 3-2 margin, with Matt Mehrassa and Daragh Fitzgerald responding with Nanaimo’s goals. A great win for Lakehill, but a loss that could put a serious dent in Nanaimo’s title aspirations. Late heroics at Oak Bay High was the story on Friday as newly signed former Jackson Cup MVP Chris Peereboom scored in the 90th minute to give the struggling Bays team a much needed three points against Vic West. Ethan May earned the shutout for the Bays United team. 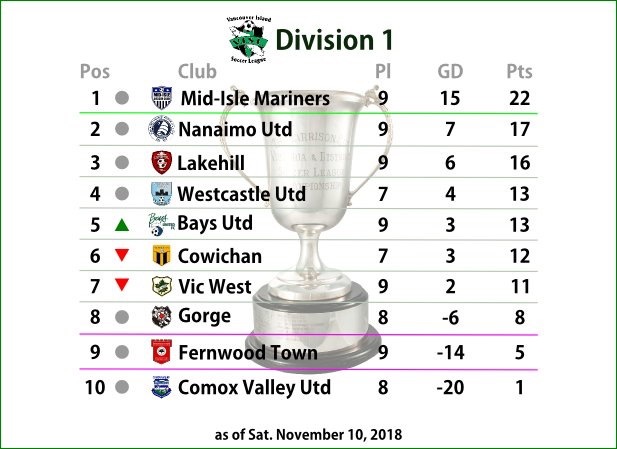 In the battle of the bottom two teams, Comox Valley Utd picked up their first point of the season after drawing 1-1 with the travelling Fernwood Town. Nick Marinus and Eugene Park had the goals for the home side, with Nick Graham and Gordon Elliot tallying for Fernwood. 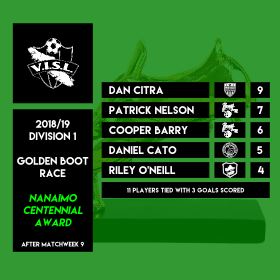 In Ladysmith, Mid-Isle Mariners capitalized on Nanaimo’s defeat to extend their lead at the top of the division to five points, defeating Gorge FC 2-0 thanks to goals from Colin Jacques and Dan Citra. Permitted U21 Keeper Cody McVie earned the shutout for Mid-Isle. The pleasant surprise to the season is seeing newly promoted Mid-Isle lead the division. While many things need to happen for that to take place, no doubt scoring by unsuspecting individuals has been huge. The final game of the weekend took place on Monday at Layritz turf and it was the McGavin Cup. Originally started in 1933, it used to be a fundraiser for injured players. As years moved on, it turned into an exhibition style tournament at the beginning of the season. In the recent handful of years, it evolved into a league wide open tournament that any team could enter, other than the top four of Division 1. This year, for the first time in history, a Division 3 team won the prestigious cup in an all-Gorge final. Gorge Us-Guys of Division 3 defeated Gorge FC of Division 1 by score of 1-0, with Steve Gately named game MVP on a beautiful day with good attendance. Just another reason that we are all thankful. 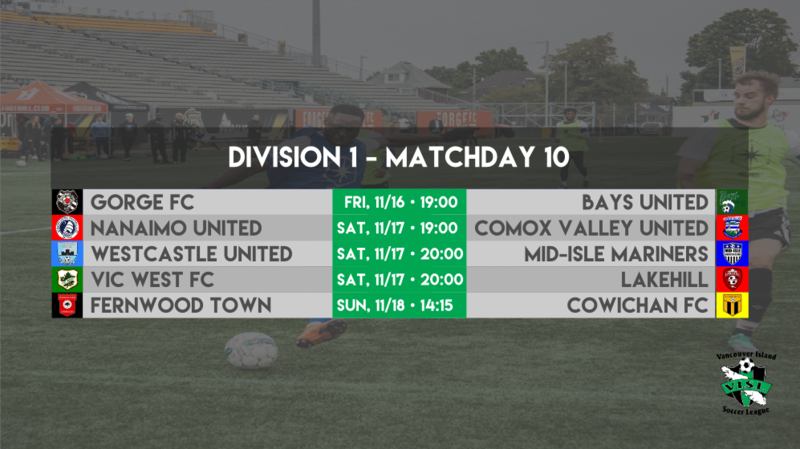 Here is what is on tap for the upcoming weekend as VISL’s Division 1 has a full slate of games happening.